Did you just purchase a boat? Are you looking to upgrade your watercraft? If so, it’s helpful to know the different types of boat shade tops and covers. From bimini tops to enclosure curtains, awnings, dodgers and standard covers, there are plenty of options! Bimini Tops: these are open-front top covers for the cockpit, made from either canvas or another specialty material. The bimini uses a metal frame and can be taken down or put up as needed. Enclosure Curtains: these are vinyl or acrylic curtains, sometimes made with other specialty textiles, that enclose your boat’s cockpit or deck area. The curtains extend, or attach to the frame of a shade cover, like a bimini top. Boat Covers: this is a piece of specially designed and measured fabric that is used to cover your entire boat when it’s not in use or is in storage. 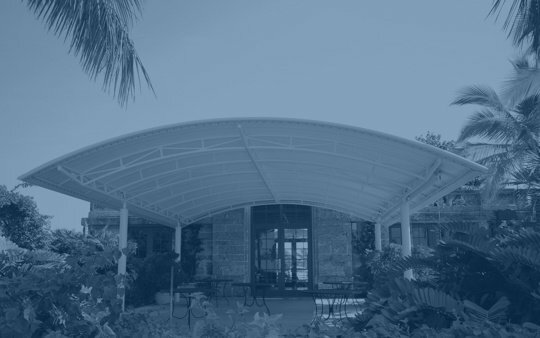 Boom Awnings: boom awnings are similar to the awning shade structures you’d find on a building. These are designed to cover the deck or another portion of the boat with shade and is not limited to just the cockpit of the boat. Boat Dodgers: these are sometimes referred to as spray-hoods. Boat dodgers use metal frames and canvas to create a protective area over the boat’s entrance and part of the cockpit area. The dodger also typically has vinyl windows. Boat Mooring Covers: Much like a boat cover, moorings are used to protect the boat when it’s not being used. However, mooring covers cover the entire boat, including below the rub rail. The list above, in no way exhaustive, may seem daunting. When it comes to making a decision about the type of boat cover or shade structure you need or want, it’s important to consider personal taste, style, and preference. There are a variety of resources to pull information from, including the Industrial Fabrics Association International boat shade top marine fabrics division dedicated to informing consumers. But why this is important? Well, the type of fabric you use will ultimately dictate the longevity of your boat top cover. You want to find a textile that features, UV Ray, water, mold and mildew resistance. You might also consider finding a boat shade top cover that is lightweight and easy to clean as well as colorfast. Check to see if your cover comes with a warranty. Without water or UV ray resistance, your boat’s shade top will fade and deteriorate faster. Eventually, you’ll find yourself buying another one, often far earlier than expected. Boat top covers that use material not designed for the rigors of the sea will fray, tear, stretch, fade, and fall apart. Basically, investing in a boat also requires investing in its accessories -- you will save in the long run.